Wolf's Pit:- results. " was another great event with John Boyle and his team doing another professional job putting on the event and the conditions were perfect for an early spring race. Graham Moffatt won a Notts fell champs V40 Silver." Helm Hill - Kendal Winter League. 15 Trigs:- a reminder that anything you've been doing can get a mention on Carshare. Adam Micklethwaite "had a go yesterday. 14h20m, so not particularly fast by the look of some times, but a great day out and a fantastic route. Didn't know if I was supposed to let someone at DPFR know for the record. If not, well at least I've shared it with somebody!" Qualification is by birth in Nottinghamshire or resident in that county for the last 9 months. Many individual age category medals; team categories for men and women with 3 runners of any age required. Team Dark Peak usually collect individual and team medals and it would be great to continue with the success we've enjoyed in the past. I'll (Dicky Wilkinson) be organising the champs again on behalf of Notts AAA." Dave Sykes sends:- "I'm due on the adventure show tonight, Sunday 21st Feb,18.20 BBC2 Scotland. I'm not sure if this can be seen live on iplayer or whether it will have to be seen a couple of hours after screening. I've not seen it so can't comment on the quality or quantity. It follows me round the Glencoe skyline last August and looks at the psychology of enjoyment and performance." - Search for "Adventure Show" in the iPlayer to see it, will be available for 30 days - Dave's piece starts at 17 minutes in. If anyone going to the Sportman this Wednesday could pick up the Landmarks race results from the hut and get them to John Dalton or Willy Kitchen, either electronically or physically it would be much appreciated. Glaisdale Rigg:- results . Four runners up there, getting popular? Ilkley Moor - results. :- Jack Foxall "was the only brown vest braving the wind to put in a very average performance at the Ilkley Moor fell race . Although there was a lot more brown clothing following the usual mudslide to the finish. A cracking route making the most of the steep ground at the edge of the moor"
Not much seems to have happened? But there is Parbold Hill Race - results , where John Hunt is 4th, 46mins 23s. Rombalds Stride - a long wander over Ilkley Moor. Ashurst Beacon - somewhere in Lancashire results . The "same procedure as every year", as John Hunt finds his way there, and stuffs all the other Vet hopefuls. .
Good to welcome visitors to the many and varied delights of Penistone Hill. The course was altered to the shorter Stoop course, which provided the expected pleasures of ice, snow, sinking bogs and holes to fall in. Results coming in due course. Could Jim please inform Rose not to chortle when she comes hurtling past me next time? Next race is High Cup Nick, 27th Feb, and if you've not done that area, above Dufton, it can't be recommended highly enough. The Nick is an impostor for Kinder Downfall, but still highly impressive. Then it's the Pennine Way to head for the finish. A right good preparation for Black Combe. Carshare might be looking for an A1 meeting, somewhere. Ireland - British Championships. Saturday 9th April. Carshare is secretly plotting an assault on the Carshare League, and has booked flights for Ireland - from Leeds/Bradford. Please let me know if you book flights, etc, and I can sort out a list of who is doing what. Any ideas on booking accommodation? We've booked B/B. Very best of wishes from Carshare, to everyone for a most enjoyable time over these next few days. Chevin Chase:- around Otley Chevin.results (maybe someone was there?). Looks to have revived memories of that Great Lakes Run, without the stream crossings. Notable runners either couldn't get, or kept well clear. Carshare wasn't even spectating. The River Wharfe was higher than a few weeks back, no doubt flowing full power through the allotment once more. But so many others have awful real concerns. Up theNab - results .Maybe it was too short a race for John Boyle, who finished 28th as a V45, then had his birthday and ran round again, finishing 77th as a V50. Is anyone having a clarification, please? The Stoop - results . back to those bleakest of Haworth quarries and moorland bogs. The heatwave hadn't reached Penistone Hill, windy, cold standing around, but decent enough once we got going. Extremely sludgy and sinkable, it's usually much worse. Lakeland Classics - 2016. Details are on P61 of the Calendar .Two of the Super Long races are needed, Wasdale, Duddon, Ennerdale and Buttermere Horseshoe, and one more - the Long Races being Borrowdale and Three Shires . No Langdale this year. "Men's Health" - our literary correspondent reports:- "get a copy of the Jan/Feb Men's Health and look at the article "49 Best Fitness Classes For Men in 2016". Somewhere around no. 34 is "Warting with Dark Peak" with a description that makes you lads sound like the finest physical specimens in the country (which of course you are)." In an attempt to conduct further research, Carshare had a sneaky look in W H Smiths, but alas, the magazine was sneak-proof. Can someone please enlighten us, or supply this essential document? Thanks to Loxley for this. The Brownlees will be pleased to be recognised as Honorary Warts, methinks. Peak Raid Overall-Results -Richard Hunt just pipped Lewis to club honours, by turning in a good result at the last event. Although Mike Sprot & Richard Guillaume are actually DPFR members , but were too shy to admit it. 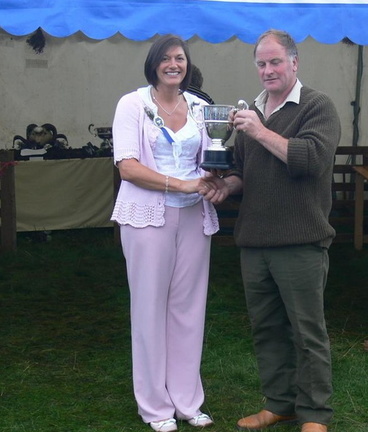 Debbie Smith won the FV40 trophy. Christmas Competition? Any suggestions forthcoming? Three Tops - DPFR event. Frostbite30 . This is a long thingy, 35miles, or not far off, around Nidderdale. I've not found the full results just yet, but Sally Fawcett was first Lady back. New Eiger Nordwand record - the Youtube clip shows Ueli Steck getting up in 2hrs 22mins, this November. The Trigger:- nothing like getting going early, is there? Sam Williams asks:- "Already put this out there on DPFR Facebook page but thought it'd be worth posting here too. Looking to arrange liftshare for Trigger (Marsden to Edale) in January. If anyone is keen, do get in touch ( email , comment, Facebook). Happy to put in money towards minibus (I'd offer to arrange but not local to city) from Sheffield or liftshare from Sheffield area/Notts/Derbyshire borderlands. Cheers, Sam"
Sale Fell - Mike has kindly sent the results for this local race, the top end of Bassenthwaite, finishing th, in 27.46. "There are no age categories but it was good to see a lad of about 17 or 18 winning, shortly ahead of his dad." Harriers v Cyclists - results. We appear to have a mystery runner, as "Joseph" has finished 99th, in 48.19. If the secret individual could enlighten us, please? Clowne Half Marathon - results. unconfirmed) that he didn't quite get round to stopping in at home for a cuppa, despite it being on the map. The final round is at Crowden on 13th December." Rightly, given the conditions and the forecast, the esteemed organiser devised a shorter course, which still had plenty packed in it. The first time that the race has been shortened. By the time the rain really set in, most runners were home, whereas had it been the full course, several people would have been tired, cold and wet, and crossing Pendle top, in the clag..
Sally Fawcett was first Lady, Nicky got a prize for something, as did David Lund and Keith. Good to meet up with several new faces. Complaints about Willy? I received a most welcome torrent of abuse on the road out, well appreciated, but did he creep past quietly at CP9? Are you losing your touch? You'll need to take lessons from Lewis? Apologies accepted - see Comments. Thanks to everyone showing their number correctly : it may seem trivial, but trying to write down a number pinned to the back of a rucsac is no help to a marshal whatsover. With CP9 being so near the end, I didn't put supplies out, and wot shal I be doing with 108 Jaffa Cakes? The Pain Barrier:- 24th October. This seems to be a 10km "race", at Tong, between Bradford and Leeds. "The Pain Barrier at Parkwood is a 10km mud race set amongst 100 acres of off road wood and parkland. The course twists and turns across a variety of terrain so you'll find yourself running along muddy tracks and open fields, through woodland, across ponds and water obstacles and tackling steep hills and ravines." In 56mins 39secs, first home is Kris Groom:- "It is a fully taped 10k race on a Land Rover driving centre, crossing various marshes, streams, ravines, and muddy-water filled dips and ruts. It is run by Neil Northrop and Pete Hodges and was great fun!" Lakeland 100 - was a good while back, in July. Please let us know if you're doing events that are off the radar for poor Carshare. This looks like 100 miles around The Lakes. Kirk Hardwick was round, in 26hrs 36mins 50 secs. Lakeland 50 results are already on DPFR results. Leg it Round Lathkil:- results. Cwm Pennant Horseshoe, AL, - Saturday 11th June. Ireland - Saturday 9th April. (not on FRA website). Was it mentioned to be a variant on the original Donard-Commedagh? Up the Nab - (Charlesworth) ,AS, Saturday 7th May. Black Combe. AM - Saturday 12th March. Borrowdale, AL - Saturday 6th August. Langdale, AL, - Saturday 8th October. Lakeland Classics - what some big, big initiative - Darren Holloway Memorial - (Buttermere Horseshoe), is listed as being part of next year's series. 25th June. Ian Hodgson and UKA Relays (Luss, Loch Lomond) - in their traditional slots, first and third weekends of October. Dusk 'til Dawn. "The races starts and at finishes in Buxton at 16:47. All hope will be abandoned soon after you leave Buxton, and you will have exactly 14 hours and 13 minutes to navigate a very challenging 13, 26 or 50 mile Peak District course, that takes in The Cat and Fiddle, Shining Tor, Cat's Tor, and on some courses follows parts of the Limestone Way." 47 seconds. I was 14 hours 10 minutes 33 seconds, 82 starters, quite a few didn't finish. It was a 50 mile run around Buxton taking in about 2,700m of ascent and descent and passing Shining Tor, Taxal Moor, Rushup Edge, Mam Tor, Lose Hill, Hope, Castleton, Cave Dale, the Limestone Way, Miller's Day, Earl Sterndale and Axe Edge Moor. The route takes in some splendid countryside and scenery but of course being a night run from dusk until dawn and in darkness the views were mostly restricted to the ability of your head torch. However, from Mam Tor to Lose Hill the moon and stars were out on the clear night illuminating an inversion with clouds covering the Hope and Edale valleys while the summits were perfectly clear. A nice well organised event running 50 miles before breakfast on Sunday." Peak Raid 3 - Round 2:-Old Glossop . results. :- No clubs are listed, so please get in touch if you've been missed off DPFR results. OMM - Tweedsmuir. results . There may well be people missing off DPFR results, so please let us know about any mistakes. There seem to be plenty of retirements? A bit damp? Snowdonia Marathon - results. Anyone needing a mention? Bronte Way - results. a linear trip across from Wycoller to Haworth.